I grew up in a country where semi sweet Merlot was the norm for most people until very recently. I thought I didn’t like wine (well, I still don’t get excited about semi sweet Merlot), until I started working on a cruise ship in 2006 (at the housekeeping department). I met Bob Bath MS there by chance, and he encouraged me to start studying and tasting wine. I got my first job as a sommelier in 2008, for which I’m ever grateful to Ben Van de Meutter, my Head Sommelier at that time. First of all, you got to be sure that you want to be a sommelier and know what it takes: long years of training, a lifelong commitment to studying, unsociable hours, physical demands and so on. You need to have very good psychological skills – you need to understand what’s going on on the table in a couple of seconds, and sell what what makes both the guests and you happy. It leads to the next trait: you have to be an excellent salesperson. 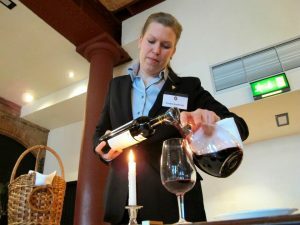 Being a sommelier should really be about selling an experience instead of taking wine orders. You also need to be very humble, there are way too many people in this profession who think they are superior to everyone. You never know who sits on your table, or who you talk to at a wine tasting. For these reasons my absolute hero is Gerard Basset MS MW, who is the epitome of the Sommelier to me. The kindest, humblest, softest spoken person, who achieved everything you can in this profession and everyone loves him. There are many, many people who I feel blessed for working with or having met, including my mentor Joao Pires MS. I learned so much from him both professionally and personally. There is no foolproof answer to this. I found working abroad a very stimulating experience, and as I want to be the best I possibly can, I need to travel and work in different places. If you are lucky to live in New York or London, then the whole wine world is right in front of you, so probably you don’t need to travel too much. However, I think it’s kind of healthy to change restaurant every few years until you gain sufficient routine and experience, having seen different perspectives, so you can be a really good leader. Do not look for quick promotion. The longer you have a great manager to learn from, the better you will be in the future. There is a reason why you need to polish glasses for weeks as a commis: you will probably have to teach hundreds of commis to this task during your career. Don’t be impatient, keep your goal in mind, but take your time to reach it. Learn from everyone: some will teach you how to do things, and there will be plenty of bad examples so you don’t have to make their mistakes again. First, you need to know what you have to sell. Any bin ends, open bottles for the BTG program, something you want to introduce to your guests for feedback before putting it on the wine list? Of course, you need to know your wine list inside out. (This is a point where most would already fail). Then, you need to know what your guests are eating. It tells a lot about the guest (I hate using the word customer, a grocery store has customers, I have guests in my restaurant), their approximate spending and level of adventurousness. You can then reach back to your little list and create a unique experience for them, where they feel special. I very often “downsell”, making my guests comfortable with their spending on something they never tried. It works for me. Of course, there are people who drink Pinot Grigio all their life, but they probably won’t ask for your advice. I like durable, quality glasses. I’m not a huge fan of having dozens of different kinds – it makes your service much slower and cost a fortune. You probably need three types minimum: a generic white, a sparkling wine and a generic red. For me they need to feel good to drink from, easy to polish and reasonably light crystal glasses. I’m trusting the two best-known premium brands for their quality. I’ve tried a lot of different manufacturers, but seem to always go back to my favourites. There are complete books on food and wine pairings – I like to keep it simple though. You should know what the wine is consumed with at their origin. Traditional, local pairings alone can give you a brilliant source of ideas. When you taste new wines, always try to imagine them with food, and if you have the chance, try these pairings and see if they work. You need to have a by-the-glass pairing with every single dish on your restaurant’s menu. You need to taste and pair every special dish the chef creates, this is where the kitchen and the wine service needs to cooperate. And of course, read the books on wine pairings if you like! Creating a wine list is a very complex task, a lot of people make a living by consulting restaurants on wine lists. Besides knowing your budget and storage capacity, you need to know the clientele, the food menu, the style of the restaurant. Creating a large list is much easier than a 15-item list. You will want to keep your regulars happy with their favourites, but offer a dynamic list to the more adventurous. I like places where I can go and have a different wine every time. I don’t think that there is such a thing as ridiculous pricing in restaurants. As a guest, it is entirely up to you whether to drink wine or not. Or, for the same reason, whether you can afford going to that restaurant or not. Who goes into a Louis Vuitton shop and start complaining about the prices? As a guest, you should be prepared to pay at least the same amount of money on the wine as you do on the food for the full experience. The margin on the wine pays the salary of a lot of staff members who made your meal a reality (at least in Europe). It is your job as a sommelier to choose wines for your list that people will be happy to pay for. As for margins, I embrace two approaches: first, give the wine a price you think it’s worth. Pretty simple. Second, there is a renaissance of the nominal margin these days: a fixed amount (say £30) on top of the cost, plus VAT. This makes the pricier bottles an incredible value, and provides you with an easy system. Of course, these only work if your restaurant does not have its margins policy in place already. You literally study all the time. When you wake up, on the bus, on your break, when you go home, when you are on holidays (which will be in a wine region, of course). There is no easy way, I consider it part of the beauty of this wonderful profession. If you are NOT ready (and happy) for this, do not even start! First, make good wine. Every year, for at least five years. I think wine fairs and trade tastings are an excellent opportunity for producers to engage with sommeliers (who generally have very little time outside of work). You need to be prepared to send sample bottles to the restaurant (I like to ask my guests what they think of the wine before I’d list it) and have a good, catchy story for me to tell them – this social element makes a good wine great for me on a wine list. If I really need to choose, probably Pinot Noir. It can only be great at the right places, but there it can provide some of the greatest wines in the world.